At some point in life we will all experience the loss of someone we dearly love and care about. It can be through sudden death, illness, or even a breakdown of a relationship. Overwhelming feelings follow, and the unprecedented feeling of loss can sometimes trigger a return to past, addictive behavior. 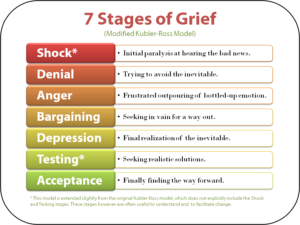 For me, understanding the grieving process and the stages a person has to go through helped me understand and finally accept the unacceptable and significantly reduced my risk of relapse. Denial – We try to dismiss the brutal reality. It’s just a natural defense system that helps us to ease the first wave of emotional pain. It’s accompanied by feelings of shock, numbness and disbelief. Anger – We try to blame something or someone for the situation. This can also include feeling guilty and blaming ourselves for the situation. Guilt is a very powerful feeling that can lead to relapse. Bargaining – We think “what if” or “If I only” in order to postpone the inevitable or to try and regain what we’ve lost. Bargaining unfortunately keeps us away from the present and locks us down in the past. Depression – We might worry about tangible and practical things, like how we will deal with reality, bills, family and friends. And then there is the personal sadness and heartbreak we experience when losing someone we love and care for. It is the feeling of emptiness; a time of loss, grief and pain. Acceptance – Do not mistake this with agreement. This is the last phase of the grieving process, sometimes indicated by a person acting withdrawn, but also very calm. This is not a period of happiness, far from it; this is the time when a person accepts the reality and slowly adapts to the new life, and starts preparing to move on. Grief can be one of the major triggers of a relapse. What can you do to help yourself go through this painful process without jeopardizing your recovery? The ABC tool is one of the tools that helps me think clearly about how I feel, and it can show me that reverting back to addictive behavior during the grieving process will not only not help me feel better, but actually, will make things a hundred times worse. What helps as well is the presence of someone else. Not someone who will just say, “It’s all going to be o.k.,” “You will get through this,” etc. Those words, even if said through the best intentions, will only make the grieving person feel worse – rather than understood. Sometimes even a silent presence is better than million words. If the feeling of loss is overwhelming, it can help to speak to a counselor or seek medical help. We have to remember that, just like there are many roads to recovery, there are also many types of grief, and we all deal with it differently. One thing for sure, though, it’s important that we allow ourselves to grieve, and it’s important that we have the chance to talk openly about our pain. For me, crying was and is an important part of the grieving process; it allows my soul to heal. Tears help me to offload the heavy emotional baggage I carry when I grieve. We present in our website a variety of creative mourning techniques; talking, writing, creating art, music or poetry, or memorializing are all good ways to express your bereavement. Explore our site to find the expressive techniques that feel “just right” for you. 50 e-mail grief support groups and two web sites. Our integrated approach to on-line grief support provides help to people working through loss and grief issues of many kinds. Click this link: Adult Support Groups to join one of our adults email grief support groups.